This is damaging. The most savory, intriguing and luscious topic of today has wreaked havoc on golf’s First Family, on the sport of woods and irons, on the entire sports hemisphere. The repercussions travel farther than Tiger Woods’ 340-yard drive. For here was a human being unlike any on earth. He was dubbed “Mr. Perfect.” He amassed a billion-dollar fortune—the first in sports history. His 10-letter name—Tiger Woods—wasn’t a first name coupled with a family name; it’s a global brand—much like Coke or Google or Apple. 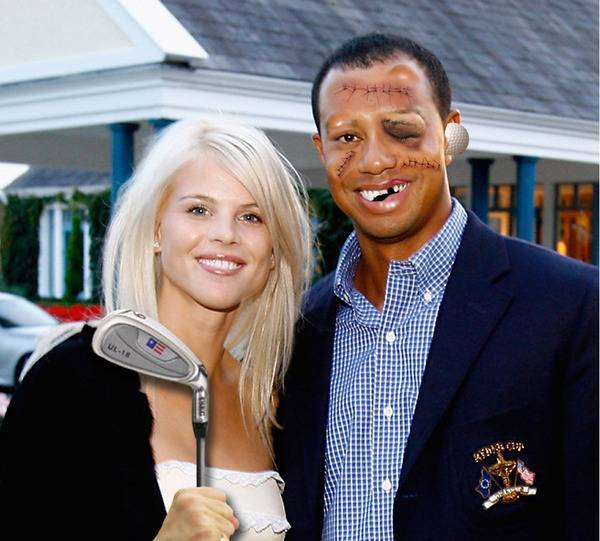 Tiger Woods owned everything… plus, plus, plus. A beautiful smile. A skin color that broke racial barriers. A swing that was emulated by 77-year-olds and 7-year-olds. Plus, he had an indestructible mind. A mental strength that was stronger than any bicep or tricep muscle. Sadly, it was this same strength—his mind—that caused him to blunder. To me, as shocking as all this was, here’s something more perplexing: How the wisest athlete on earth bungled on his response. Because, I ask, would it not have been better to have seen Tiger himself hold a three-minute press-conference explaining, in his own voice and with a humble and sorry heart, what happened? Not to elaborate on details. Not to answer questions in a never-ending Q & A session. Not to say he slept with three dozen or 69 bargirls—but to explain, in simple yet contrite words, his transgressions and sorrowfulness. Not in his website. In person. Never mind if his face was swollen (from the golf iron club that his wife, Elin, whacked on his forehead during that fateful night? ), his personal admission would have been essential. Wasn’t this what Kobe Bryant did? The same with Michael Jordan? Did they not speak to us on TV and apologize to their families and to their fans? Too bad TW did not consult his buddies, KB and MJ. For here’s what happened the past 20 days. Because of the “no-news” from TW, bad news erupted. Bloggers gossiped. Tabloids buzzed. Columnists babbled. This controversy has been transformed into one of 2009’s most sensational of stories. Or maybe Tiger should have copied our very own, Manny Pacquiao. Days before his victory over Miguel Cotto and, worse, hours after he annihilated the Puerto Rican, weren’t we all, instead of celebrating Pacman’s victory, talking tsismis about Krista Ranillo? Absolutely. It was an intriguing and tempting story. And didn’t we all see, on TV, how Jinkee cried during the victory mass and wouldn’t even kiss his seven-time world champion husband? The non-stop tsismis began. So much so that when Manny and Jinkee flew back to Manila from Los Angeles, weren’t we all-too-curious on their marriage? Divorce! we shouted. But Manny is smart. Never mind if his alleged tryst with KR was untrue or true, the minute the Pacquiaos stepped off the plane, they smiled. They held hands. They hugged. At the Mall of Asia concert, they appeared on stage as if on a honeymoon, holding hands, kissing on the lips. What happened after that? The rumors disappeared as fast as Manny’s left hook. Of course, all thanks to Jinkee who appeared unaffected by all the scandalous talks. But MP did his part: He did not hide. He did not evade. Not Tiger. For each day that he recluses himself at home, it’s an extra 24 hours for the billions worldwide to chastise him and inflict gossip on him that will forever tarnish and impair his brand-name. Appear on Oprah? That’s probably a good move. Although I’m not sure if he’s willing to tell-all—because, based on the fascinating stories these women have poured out in public, their illicit affairs have been wild and spectacular. Still, the point is clear: Tiger should face the world with his own face.